The food truck craze rose to popularity almost a decade ago in the metro Phoenix area, and thankfully is still going strong. Within that decade, we’ve seen many business owners paying more attention to both their environmental impact and social impact of their operations. We recently interviewed Kristine Mill, owner of Wok This Way food truck, to learn more about how she operates with people and planet in mind. Why is environmental sustainability important to you? It’s hard to look at environmental sustainability without addressing the three pillars of sustainability: economic, environmental and social. They all seem play together in my business. My background practicing as a therapist has shaped my outlook on what others can achieve if given a chance to grow. While embarking on my passion for cooking healthy food and building my food truck, I wanted to incorporate compassion toward animals, the environment, and promoting jobs. I believe when you empower through employment for special needs individuals they succeed far beyond what society can comprehend. It provides purpose and need. The impact of the food industry in climate change, pollution and other environmental factors went into account when building my truck. Waste reduction and recycling, sustainable furnishing and building materials, water efficiency, energy conservation and chemical and pollution reduction are all important areas which I focus on. 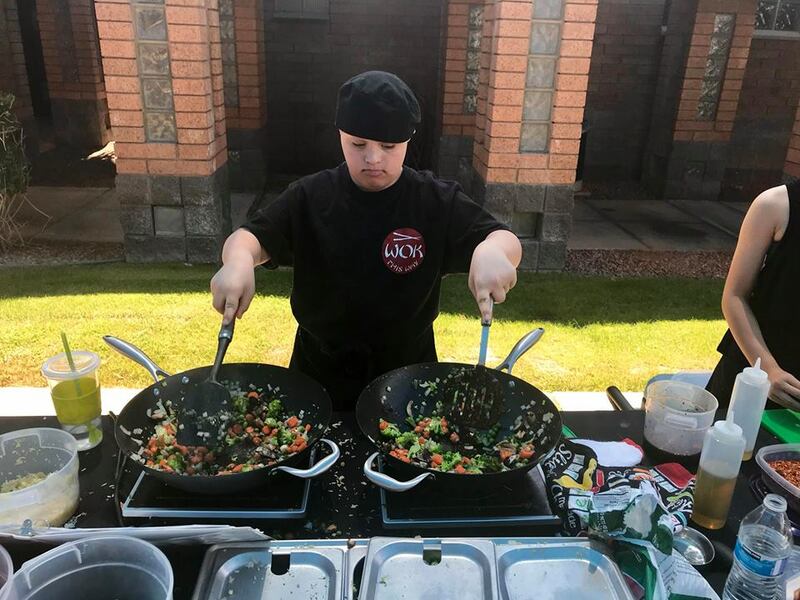 Wok This Way has a strong social impact mission inspired by your nephew Jake, who was born with Down Syndrome. Share how the food truck plays a role in helping the special needs community. We are working with Down Syndrome Network, Sharing Down Syndrome, Metro Tech Culinary Program and other agencies to provide cooking instruction classes, training, and hiring of special needs individuals for the truck. According to the U.S. Bureau of Labor Statistics, 18.7 percent of people with disabilities were employed in 2017 compared with 65.7 percent of the abled population. We want to provide employment for special needs individuals. We look at the person’s strengths for job placements. My nephew, Jake and I interview all candidates together. Our most recent hire is 21 year old Maddison, who has Down Syndrome. She preps the vegetables and during the service will fill in where needed. She is an outstanding worker, and her motivation and enthusiasm is addicting. Her father has stated within the past month of his daughter working on the truck he has seen confidence build within her. She is coming out of her shell and becoming more outgoing. Wok This Way has received certification through the Green Restaurant Association. What are the sustainability practices that you perform that helped you achieve the certification? On the truck we have all Energy Star refrigerators and water heater, water efficient sinks and LED lighting. We serve only vegan and vegetarian meals, and incorporate organic produce. We signed a “no styrofoam packaging” agreement, are paperless in point of sale, and use recyclable napkins and paper bags instead of plastic. We have a recycling can on the truck and provide ongoing training for employees about our sustainability efforts. We also carpool employees to the train station after their shifts. What sustainability practices are on your wish list as things you'd like to do? We are moving to the next level of the Green Restaurant certification. We are going to partner with other community restaurants and business to compost. We are also looking at how to make our truck run on biodiesel. At food truck events and in the trucking community, I talk to others about the need for sustainability and how to start making small changes. I am proud to say that I’ve helped food vendors change their packaging to more sustainable options. I believe strongly in teaching others. Have you noticed a positive response from customers in regards to sustainability initiatives? Customers are excited about the food truck with the cause. Not only do we empower through employment for special needs but we care about the environment, animals and humankind.